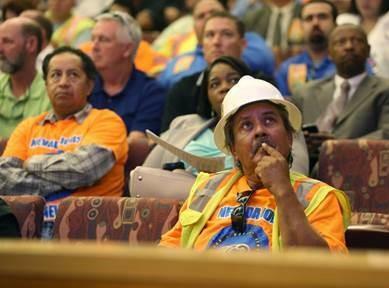 LIUNA members in Las Vegas fought for and won what will amount to about $700 million in transportation investments, which kicked in and began creating jobs this month. Members of LIUNA Local 872 were instrumental in convincing the Clark County Commission to pass by a 6-to-1 vote a phased-in 10 cents-a-gallon gas tax increase to be used to fund projects. In the end, the majority of commissioners sided with the pleas of people like Jimmy McNeece. McNeece, a construction worker, moved to Las Vegas from Long Island, N.Y., in 2005 when times were good. At first, it went well for him with the economy booming. Now, McNeece said he struggles to find enough work. “Las Vegas needs to get to work,” he said. McNeece, along with other members of the Laborers Local 872, made a strong show of union support for the proposal at the meeting, saying it’s necessary for economic growth. Organized labor groups strongly encouraged commissioners to pass the measure. The Nevada AFL-CIO, which represents a variety of unions, had passed a resolution in support of the fuel tax. Meanwhile, nationally the last significant boost of investment to our nation’s crumbling infrastructure in this magnitude was a 4.3 cents gas tax under President Bill Clinton in 1993. Since then, bridges have collapsed and roads have deteriorated. A fourth of America’s bridges are deficient or obsolete. Half of America’s urban roadways are deficient, which causes the average motorist $324 in damages and repairs a year. The boost to Clark County’s transportation infrastructure will fund road projects in the county, including completing the Las Vegas Beltway and work on Interstate 11, which will run between Las Vegas and Phoenix, Arizona.